Without reasonable explanation, the Chinese authorities have officially close the north, or Tibetan, side of Mount Everest to all expeditions this spring, save for their own Olympic Torch relay to the summit. And, in a move of political coercion, they are also trying to get the Nepali government to do the same and close the south, or Nepal, side of the mountain. One can only believe that this unprecedented move comes as a knee-jerk reaction to the Free Tibet protests on Everest last spring (see YouTube video here), and a deep fear that the same would happen again this spring, threatening to spark discourse on not only the issue of Tibet, but also on China's other minority groups, such as the Uygur people of Xinjiang Province. 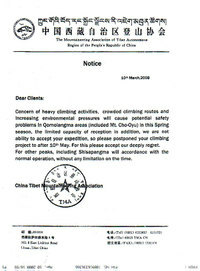 Concern of heavy climbing activities, crowded climbing routes and increasing environmental pressures will cause potential safety problems in Qomalangma [Everest] areas. But, as MountEverest.net points out, numbers on the Tibetan side of the mountain were actually down this year compared to previous seasons due to expeditions obeying China's demand that teams be nationally oriented and apply for permits months ahead of time to allow for adequate political screening. So, with numbers down already, the argument of concern for safety and the environment of Everest falls short. but also the closure of nearby, the world's 6th highest peak lying some 10 miles to the west of Everest. With these two additions, it becomes painfully apparent that China's concerns are not for safety of climbers, nor for protection of the local environment, but rather to eliminate the risk of their historic Olympic torch relay to the Top of the World being tainted by someone holding a "Free Tibet" (or "Free Xinjiang") banner in the background. And, China's recent actions in Tibet and elsewhere show their trepidation about protests marring their image before the Olympics. According to Radio Free Asia and several other news outlets, on Tuesday Chinese authorities and armed police used teargas to break up the second day of protests by monks in Tibet's capitol city, Lhasa. Additionally, the Chinese government has made claims about terrorist threats to the Olympic games...claims which many see as a smokescreen for Beijing's increased crackdown on the Uyghurs. And Nepal - who relies heavily on Chinese support and trade for its survival as well as on Everest climbing and expeditions - has not completely caved in, but has compromised, allowing climbing expeditions for this year but keeping people from going to the summit when the torch is making its historic run to the top. In the immediate timeframe, it is climbers, expeditions, and support teams who will suffer. Expedition leaders like Russel Brice - who brings expeditions to the Tibetan side of Everest every year - and Eric Simonson, who has been frantically reorganizing an Everest Basecamp trek he had booked. The clients of these leaders, who have planned and paid for their trips and alotted the time to do them, will also be left out in the cold. And, of course, the Nepali and Tibetan support teams, from yak herders to high-altitude Sherpas and Nepali climbers, will be out of a season's worth of work, which is a bigger issue than all the others combined. But, longer term, China's decisions will impact China itself. Sure, in the short-term they may succeed in sanitizing the issues going on at home, the political angst and dubious human rights situations. But, long term, China's covering up of its imperfections rather than admitting them and working hard to deal with them, will only succeed in showing its desire to pretend. Greatness comes from striving for perfection while simultaneously admitting our shortcomings and working to correct them. What do you think about the Chinese decision to close Everest this spring? Please comment below. As usual Jake, you've hit the nail on the head. Obviously China only has one thing on it's mind, and that's get the Torch to the top. They're willing to take what ever steps necessary in order to do so, as the Olympics are intended to be a huge "Coming Out Party" for them. The North Side is going to be a media circus, with or without the other teams. Thanks for your comment. Had not heard that about Russ, but it figures. Glad he'll be able to salvage something for this season. Will certainly be interesting to see what the Nepali government decides to do, and how teams react to the changes. It's such a shame that climbing and trekking - the one sport where people want to get away from the hassle of daily life and see something beautiful - should be marred by political slurs and in-fighting. Places like this really do feel like they should be above the boundaries and quarrels of people. Maybe it should have the same undefined status as Antartica?